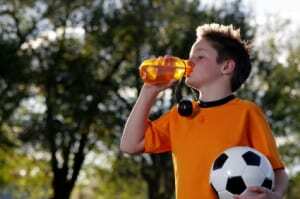 Sports Drinks for Kids: A Do or a Don't? You are here: Home / Family Food / Sports Drinks for Kids: A Do or a Don’t? Sports Drinks for Kids: A Do or a Don’t? Sports drinks have been getting a lot of bad press lately. Google the subject, and you’ll find a myriad of newspaper articles and blog posts “exposing” sports drinks for what they are—water with sugar and a little artificial coloring. But it’s no surprise that sports drinks have sugar in them; that’s something that’s never been hidden. The real question is, will that extra sugar be bad for your kid? Well, as most things, it depends. Are Sports Drinks For Kids Good Or Bad? Dental Health: One mark against sports drinks like Gatorade is that they can be bad for your teeth, if you drink them often enough. They all are relatively acidic, which can lead to enamel degradation. Juice and soda are acidic too, though, so it’s not like sports drinks are special in that regard. Performance: The literature review of the effectiveness of sports drinks on preventing dehydration and increasing performance is mixed. In most respects, water and sports drinks perform equally well. After working out however, kids who have had the sports drink have been shown to have a higher body weight—meaning they lost less fluids during their workout. This is one potential benefit of choosing a sports drink over water. Calories: Sports drinks are generally full of high-fructose corn syrup, providing many sugary calories to whoever drinks them. For example, 20 ounces of Gatorade Performance has 122 calories! That’s less than 20 ounces of soda, but it’s still nothing to sneeze at. And, many studies have correlated a higher intake of sugary beverages, like soda and sports drinks, to higher body mass index and worse diet in children. It makes sense right? If a kid is drinking soda all the time, they’re consuming more calories, and drinking less of the beverages that are actually beneficial, like milk or 100% juice; greater intake of those beverages correlated to an adequate intake of calcium, vitamin C, vitamin A, and magnesium. In Moderation: If you look at all the scientific studies I mentioned above, you might want to make a knee jerk reaction and pull that sports drink right out of your kid’s hands. Those studies aren’t about your specific child or family, however, and it’s important to realize how your particular situation could come into play. If you live in a house where kids rarely have soda or other sugary drinks, letting them have a Sports Drink at sports practice isn’t going to make them obese. If your kid is already guzzling soda at home, then adding a sports drink isn’t going to help—but sports drinks are only one thing that should be on your list of dietary worries. What you do want to avoid is having your kid think that sports drinks are somehow “healthy,” when the truth is that they’re not. And, you don’t want a situation where your kid drinks sports drinks in place of water, because they think the sports drink will somehow make them feel better. However, as long as the drinks are had in moderation, like being consumed only at a specific activity like sports practice, they aren’t going to make your kid unhealthy. Other Possible Beverages: I would caution parents to avoid replacing regularly sugared sports drinks with lower-calorie artificially sweetened ones. The trouble with these? In studies, greater intake of diet soda has been linked to higher Body Mass Index. Why? People rationalize that they are consuming less calories, so they “make up” for it by eating more. Instead, try creating your own fruit-infused water. Cut up strawberries, cucumbers, and apple slices, and let them sit overnight in a pitcher of water. The result is delicious and low-calorie. Or, have your child just drink plain water with a squeeze of lemon. The Bottom Line: If your kid eats a healthy diet and avoids most sugary beverages, letting them have a sports drink at their practice or game isn’t going to hurt. Just don’t let sugary sports-drinks replace water in regular day to day activities.